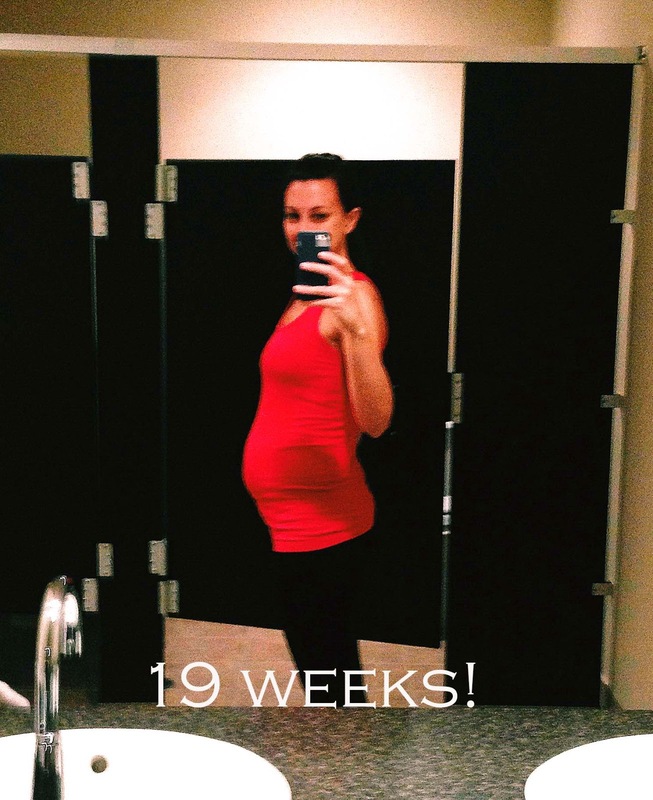 jess at home: bump #2 - 19 weeks! bump #2 - 19 weeks! Another BAD selfie at the gym but this time taken in the bathroom. Glamorous and terrible quality. Don’t be fooled….I am not super fit or anything. I only exercised a few times this past week, and am wearing a fitted top so you can see the bump. We had an awesome ultrasound recently which is one of my favorite parts of pregnancy…once they tell you the baby is healthy of course. I actually became emotional during this visit (it is dark – no one saw) just because I give myself so much anxiety leading into visits like this. I guess once you have a “bad” ultrasound (Emerson’s birth) you become a worrier. Hell I think most pregnant women worry. My appointment was great and one thing I have to start thinking about is the birth - a scheduled c-section or a VBAC. I was all for the scheduled c-section to have a controlled experience (opposite of last time), but my doctor said I am a really good candidate (he did this without being pushy) for a VBAC since I didn't even get to try last time which is a valid point. The biggest thing with a VBAC is you can’t receive meds to progress things, the baby has to be ready on its own which I would prefer anyways. I am not ready to think about this yet! Maternity clothes: Mix of both! Stretch marks: Nope, but I am religious about putting lotion on. Sleep: Awful. Emerson had bronchitis and hasn't slept great in almost a week. The getting up constantly is one thing, but she has been waking up for the day at 4. That is just rough after a few days of it. Plus she isn’t napping – she was on a steroid again that made her wild. I am just ready to have my daughter back! I also can’t wait to burn her nebulizer. I might have a medical device bonfire and throw in my breast pump in with it. Two pieces of equipment you totally need, but you hate at the same time. Miss Anything? Sleep? Haha. I actually rarely want wine anymore (I think it is like any type of food – once you give it up you don’t really crave it/ want it) but when we officially were back on with the house (it almost feel through again due to the appraisal) I wanted to celebrate with a cocktail. First time I have really craved a drink. Movement: Yep...a lot at night now that I am awake then. It is a surreal feeling to be rocking your daughter and feeling your other baby move around inside of you! Food cravings: Uhhhh….not sure if I actually craved this or my inner fat girl allowed me to eat this, but pound cake. I can’t keep stuff like that my house because I go crazy and have no self-control. Even topped it off with strawberries and ice cream. Delicious. I plan on stopping by the Fresh Market and picking up a lemon flavored one today to reward myself for the lack of sleep. Anything making you queasy or sick? I know there is a correlation between lack of sleep and nausea. I felt it again this past week, but nothing like first trimester. Gender: We found out last week! I am going to make a post on it, but I want to try to get a good picture of Emerson which will have to wait till she feels better. We are planning to do one Sunday. Symptoms: Big. It is getting harder to pick things off the ground while holding Emerson. I am also starting to get cramps in my calves which I remember from last pregnancy. Happy or Moody: Happy! The gender reveal was awesome and seeing our nugget on the ultrasound completely healthy and moving around is so amazing. I can’t wait to meet this little person! Looking forward to: Moving! Ready to start working on Emerson’s big girl room. Exercise: Tracy Anderson one day, T25 Gamma one day, and I did the elliptical one time while watching HGTV so I am not sure how much that counts. bump #2 - 21 & 22 weeks! bump #2 - 20 weeks!